I love Paris. I fell in love with Paris even before we met and after having spent a few days – this love affair continues to grow. Thomas Jefferson summed up my feelings on Paris. To quote, “A walk about Paris will provide lessons in history, beauty, and in the point of Life”. 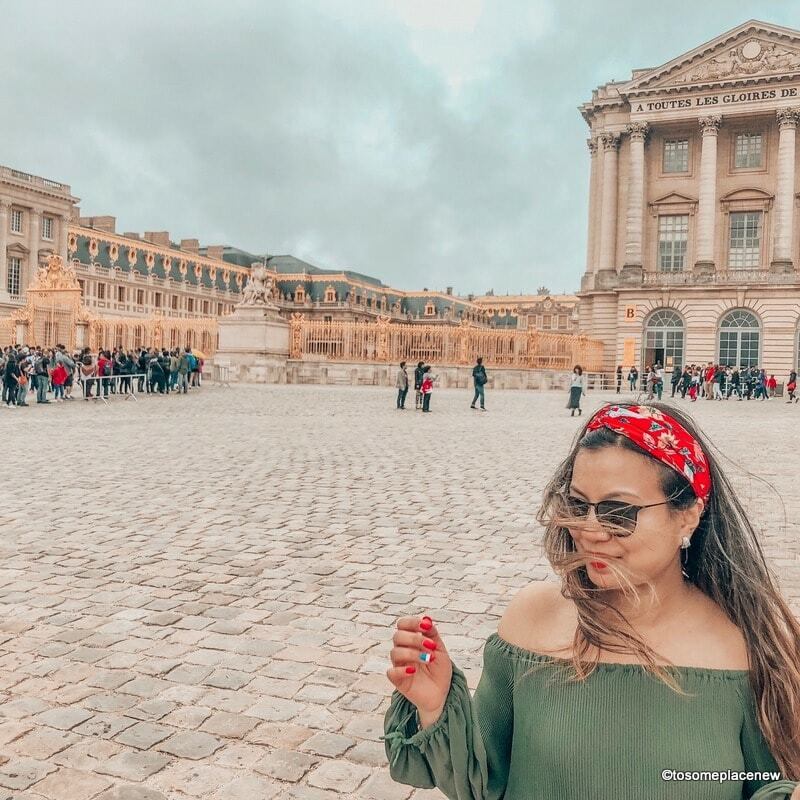 Truly, when we explored Paris, we found beauty in the old charming lanes, the abundance of history and the everyday life in vintage – lovely neighborhoods, just straight out of postcards. 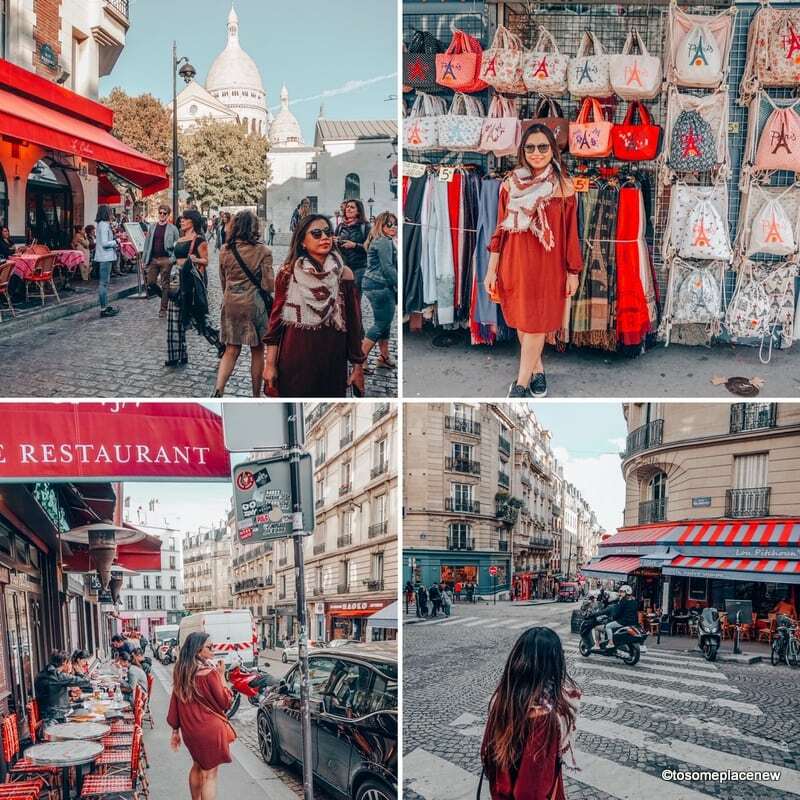 Our 4 day Paris Itinerary was about getting lost in the city’s lanes, checking off the iconic landmarks and bringing back tons of unforgettable memories. 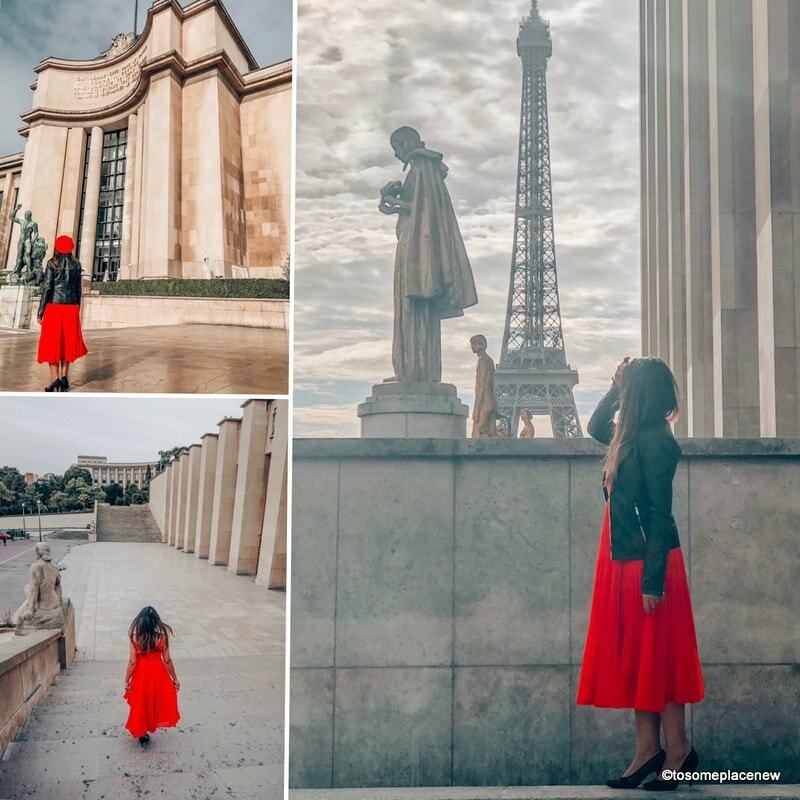 4 Day Paris Itinerary – How to spend 4 days in Paris? Pin! Paris Itinerary 4 days – What to do in Paris in 4 days? There are three airports in Paris – Charles de Gaulle International Airport, Orly Airport and Beauvais-Tille Airport. Orly Airport is the second international airport in Paris, and is around the same distance as the Charles de Gaulle (45 minutes from the city center). From Orly, you can either take a taxi or a shuttle bus. The shuttle buses leave every 15 minutes. Beauvais-Tille Airport is for budget airlines only (RyanAir and Wizz Air). It takes about 80 minutes to arrive to the city center from the Beauvais-Tille Airport. There are 2 options to get to Paris from the airport – airport transfer buses (takes 80 minutes, tickets can be purchased at the terminal), by train (from the airport to the train station is 15 minutes by taxi and then the train takes another 80 minutes. Taxi fare is around 15 euros). Paris is divided into 20 arrondissements (arr.) or boroughs. We narrowed down the areas to the best places to stay in Paris and have provided with some hotel recommendations below. Keep in mind, Paris is home to some of the finest and luxurious hotels and it is well worth investing the money in a boutique hotel with great views. Most of the luxury hotels are located near the city centre (1st and 8th arr.) There are also quaint Parisian neighborhoods (Montmartre, Marais, 11th arr.) that are well connected by Paris metro, which are great options to stay, if you are looking for mid to budget range hotels and do not mind the distance from the city centre. Book your Paris hotels here. Hotel Plaza Athenee has 154 rooms and 5- star restaurants on site. This hotel really pampers you – with 80 drinks to choose from your personalized minibar, options for 5 pillow types for a good night’s sleep, a shoe shine service and free access to the Dior spa – included as part of your stay. It is located on the 8th arr. which makes it so accessible to all the Paris tourist spots in minutes. Hotel Plaza Athenee was awarded the “Palace distinction” for being ONE of the finest luxury hotels in France. Stay at this hotel for its history, luxurious and one of kind treatment and of course Eiffel tower views! Park Hyatt Paris Vendome – Park Hyatt Paris Vendome is a luxury hotel located on the 2nd arr. One of the finest hotels in Paris, Park Hyatt Paris Vendome brings in stunning interiors, an in house spa and 3 restaurants including a Michelin star restaurant. The 24-hour reception organizes a personal shopper for you, upon request. Stay at this hotel to experience luxury, delicious breakfast at a convenient location. Mercure Paris Montmartre Sacre Coeur – Located in Montmartre (18th arr. ), Mercure Paris Montmartre Sacre Coeur provides easy access to the charming Montmartre neighborhood, including the iconic landmarks – Moulin Rouge and the Sacre Coeur. Lots of shopping and restaurant options to choose from. Metro station is easily accessible. Stay at this hotel for a romantic vacation, access to sightseeing areas. Great value. Hotel Eiffel Capitol is a 3 star hotel, located only 10 minute away from the Eiffel tower. The location of this hotel is perfect and convenient to view Paris attractions like Eiffel Tower, Arc de Triomphe, Porte de Versailles Exhibition and Dupleix Metro Station are just a few steps away. There are a variety of restaurants, cafes and bars near the hotel property as well. Stay at this hotel for its convenient location and good value for money. Hotel iBis Issy Les Moulineaux Val Seine – This is where we stayed. The hotel is located in the 15th arrondissement. Metro stations are located close by (Issy de Marie). As we were out and about exploring all day long the hotel neighborhood didn’t bother us. The room rates were of good value. The first day of Paris Itinerary should include the BEST that Paris is known for. On this day, explore the Trocadero Gardens, then head to the stunning Eiffel Tower and more Paris tourist spots and finally finish the day at the Lourve. Before you start your day, it is worthwhile to check out a few ways to explore Paris. On our trip to Paris, we utilized the hop-on and hop-off sightseeing tours to save time and changing RER trains in the city. These tours commence at the Trocadero gardens – so as long you arrive there, you can ride on one of these sightseeing buses for the day. Grab a map (like the one added in this article) and then get down whenever you like to explore. These are not guided tours, it is more of a convenience in traveling from point A to B. Continue reading to find out what tourist spots you should cover. Click here to book your hop-on and hop-off sightseeing bus tour. 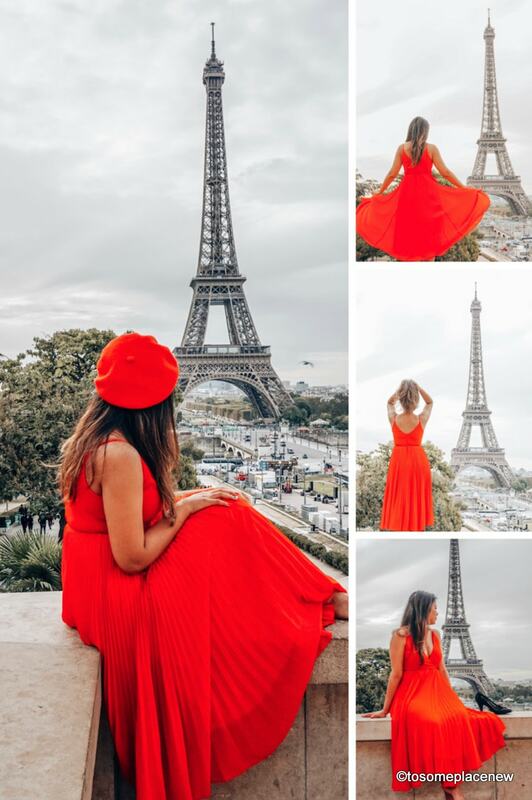 Paris Pass – Another great option for sightseeing is to purchase a Paris Pass – with the Paris Pass you can get access to over 60 attractions in the city (including Paris museum pass/access and fast track entry), free public transportation and also 1 day of hop-on and hop-off tour. The Paris Pass can be purchased for 2, 3 or 6 days. We have highlighted some of the individual tours and entry fee for each tourist spot below as well. To save money on transport and get more of your four days in Paris, get the 3 day Paris Pass. Start your day at the Trocadero Gardens. Jardins du Trocadero is a garden and along with the Palais de Chaillot (which is built on a hilltop) provides excellent views of the Eiffel tower. This site (also the seat of a former palace) was named after the Battle of Trocadero, 1878. Today, the Trocadero has 3 museums on site, along with the gardens. The garden also has fountains called the Fountain of Warsaw, whose still waters create perfect reflections of the Eiffel tower. Fountain of Warsaw are the largest fountains in Paris. Most tours and sightseeing buses start at the Trocadero gardens. Trocadero is easily connected via Paris metro. We arrived here at 7:30 am and the place was already filled with a lot of people. Still it wasn’t too too crowded. Entry to the gardens is completely free. We clicked some photos of the Trocadero Gardens and of course the Iron Lady. You can get awesome shots of the Eiffel Tower from here. We also decided to have some breakfast at the Trocadero – watch the sun go up against the Eiffel Tower, whilst sipping some lattes, baguette fromage and croissants. There is a coffee and breakfast stall set up at the Trocadero, along with vendors selling Paris souvenirs. Gustave Eiffel, the architect of the Eiffel tower, once said, “I ought to be jealous of the tower. She is more famous than I am“. Referring to the Eiffel Tower, and you might already know that the Tour Eiffel is an iconic symbol of France and romance. It is the WORLD’S most visited paid structure. Needless to say, you got to visit to see for yourself. The Eiffel Tower was originally built as an entry gate to World Fair (Exposition), had nothing to do with romance actually. If you compare the tower to some of the tallest buildings in the world, it is actually as tall as a skyscraper with 81 floors. However, the Eiffel is the tallest structure in the whole of Paris at 324 metres high, followed by the tallest skyscraper – Tour First (a commercial building) at 231 metres. From the Trocadero when you make your way to the Eiffel Tower, you will find ample opportunities to capture and admire the stunning structure. The streets, trees and the Carrousel de la Eiffel Tower (Eiffel Tour Carousel) makes for a charming, romanticized view. 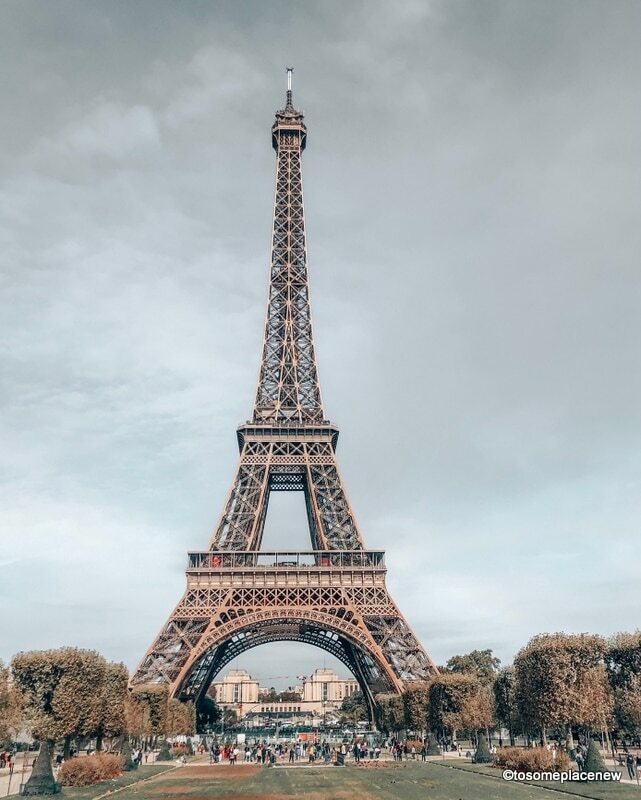 To view the Eiffel tower closely, there is an entry fee and depending on how close, under or top you wish to go to the tower, the access fees are different. Technically to view the Eiffel or walk on the grounds is free, but to access the tower itself you pay a fee. There are 3 floors of the Eiffel tower, where visitors are granted access. 1st floor – The 1st floor of the tower has a transparent glass floor. 2nd floor – 2nd floor provides you with mesmerizing views over Paris. View the sights of the Parisian iconic building like the Invalides, Notre Dame, Lourve, Grand Palais and the Seine river. There are restaurants and souvenirs shops located here as well. The second floor is most popular among tourists, also because of the romantic dining options. You can book your tickets online to the second floor. Summit – With 2 lifts, you will be taken to the summit of the Eiffel tower at 273 metres high and you can see the whole of Paris below you. There is an open air and indoor viewing areas. There is a champagne bar and a museum dedicated to Gustave Eiffel at the top floor. Book your summit tour of the Eiffel Tower. Esplanade – This is the ground level, from where you can see the tower soaring on top of you. The hydraulic lifts located at the basement on either side of the tower operate the lifts to take you to the tower floors and summit. Ticket counters, information desk, souvenirs stores and other stores are located here. If you wish to access the 2nd floor or the summit of the Eiffel Tower, give yourself enough time. 2-4 hours easily. 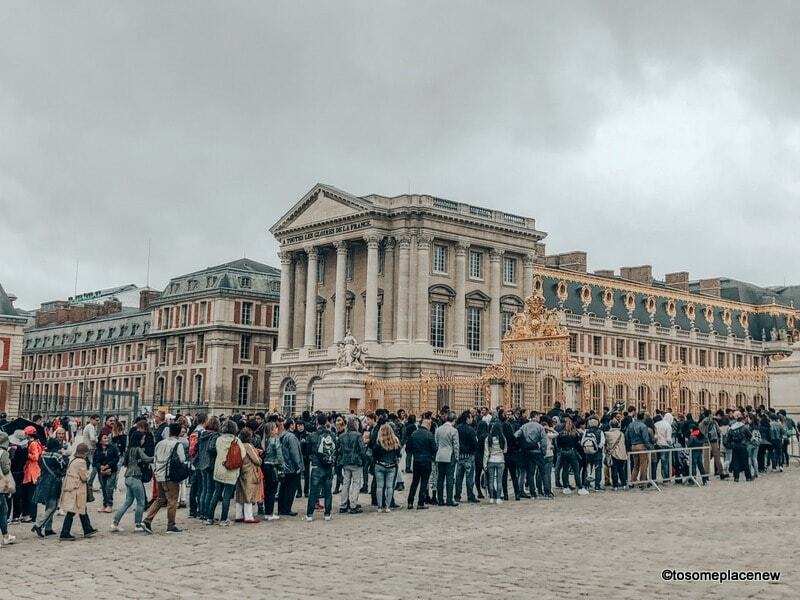 Most online access tickets are for 90 to 120 minutes (2 hours) like this one, but Eiffel tower is notorious for LONG lines and wait times, even with a “skip the line” ticket. So give yourself time. The same applies for the Summit. Book your summit tour in advance. Whenever you book your ticket, choose a time slot and arrive 30 minutes ahead of time to line up and go through security checks. Booking tickets ahead of time will confirm your slot and save you money. You can also buy tickets at the tower, depending on availability, at individual cost. Eiffel Tower can also be accessed via stairs. Stair access tickets are only available at the tower, not sold online. You can only take the stairs up-to the 2nd floor. A romantic dinner at the Eiffel tower is a GREAT way to celebrate Paris and you! Reserve your Eiffel tower dinner (or lunch) here. Safety: Eiffel Tower is a major attraction in Paris and there is heightened security in and around the structure. Be careful and aware of your surroundings. Travel light and don’t carry additional bags or camera (or other flashy things). Hours: Eiffel Tower is open all year around. Depending on the season, there are different timings for the tower access. It is a wonderful sight to see the Eiffel tower shining bright at night. Did you know that the Eiffel Tower has a furnished apartment? Gustave Eiffel built the apartment/office for himself – third floor. You can take a peek at it while on your way to the Summit. From the Eiffel tower, make your way to another Parisian popular spot – Champs-Élysées. Champs Elysees is a stretch of lane extending from the Arc de Triomphe to the Place de la Concorde. Take a quick stroll and admire the gardens and vintage buildings. Champs Elysees is popular as a shopping street as well. The most Instagrammable Laduree store and one of the largest Louis Vuitton stores are located here. Shop or window shop here and grab a bite to eat before heading to the Arc de Triomphe. We went in to the Laduree store here to try out some macaroons and get souvenirs back home. The place was packed – took us almost 15 – 20 minutes to get our macaroons. But they were DELICIOUS. 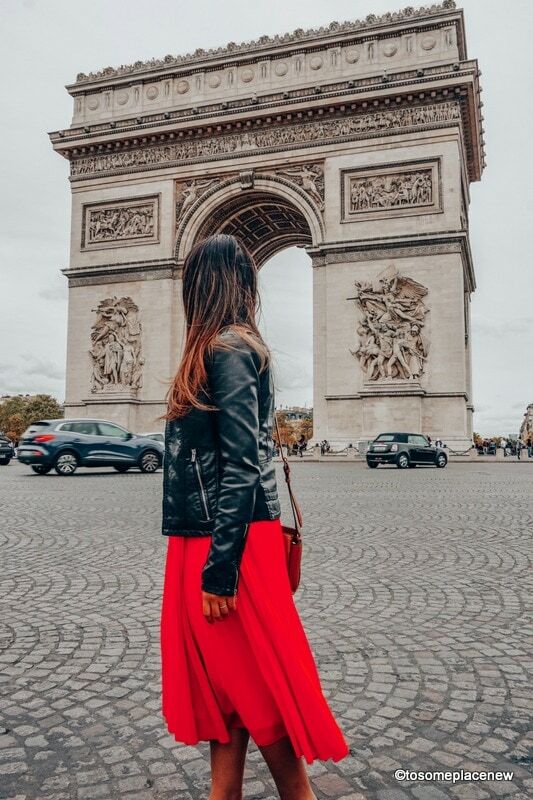 The Arc de Triomphe de l’Étoile (or Arc de Triomphe) is a stunning neoclassical archway located at the west end of Champs Elysees. The construction of the archway was ordered by Napoleon to honor the brave-hearts from the Napoleonic wars and the French Revolution. Today it attracts tourists from all over the world. From the west end of Champs Elysees, you can see or view the Arc de Triomphe. In between Champs Elysees and Arc de Triomphe is a busy roundabout and heavy traffic. Pro tip: Do not attempt to cross the road. There is an underground pedway available to access the archway. 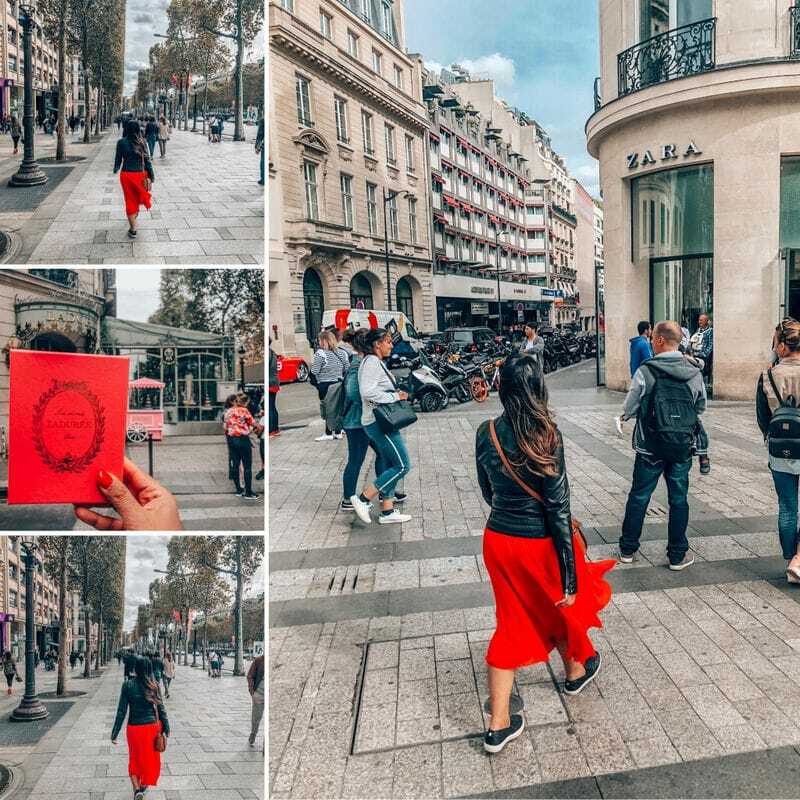 If you are taking pictures from Champs Elysees (like we did – guilty), look out for oncoming traffic and stay on the walkway. That area is super crowded with people and street artists – be careful and stay alert. Careful with your belongings. You can access the top of the archway, to get some breathtaking views of Paris. For less then $15 USD, you can capture some amazing views. Book your rooftop access tickets here. From the Arc de Triomphe and Champs-Elysees, head to Grand Palais. Grand Palais des Champs-Elysees or the Great Palace is a large historic site, an exhibition hall and museum. If you are not interested in exploring the museum displays, we would still recommend visiting the complex and admiring the beautiful architecture. The Grand Palais is open everyday except Tuesday and an entry fee costs about 15 euros. Close to the Grand Palais, is a smaller art museum – Petit Palais. Petit Palais is less crowded than the Great Palace. You should be able to explore the museum is an hour or so. There is a statue of Sir Winston Churchill located at the Petit Palais grounds. Both Grand and Petit Palais were built as part of the 1900 Universal Exposition. Another stunning structure built during this exhibition was the beautiful Pont Alexandre III (bridge) built over the river Seine. The Pont Alexandre iii is located close to the Grand Palais, so definitely stop by to admire the bridge architecture. Paris’s Opera House or the Palais Garnier is the State Opera and the seat of Paris Opera Ballet. The stunning Opéra Garnier was built by Charles Garnier by winning the opera house design competition. The Opera House is beautiful to look at. And we have heard and seen amazing (and luxurious) details of the interiors. You can book a 90 minute guided tour of the Opéra Garnier. We finished our first day of sightseeing in Paris by visiting the Lourve. There are many ways to spend evening in Paris, we chose to spend it at the Lourve. Arrive late afternoon before the museum closes and explore the art displays. 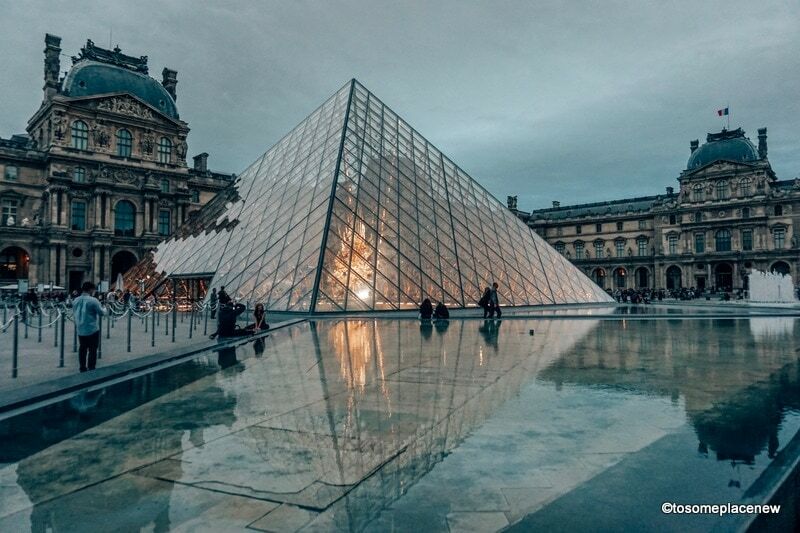 It takes 2-3 hours to completely enjoy and explore the Lourve, so give yourself enough time. 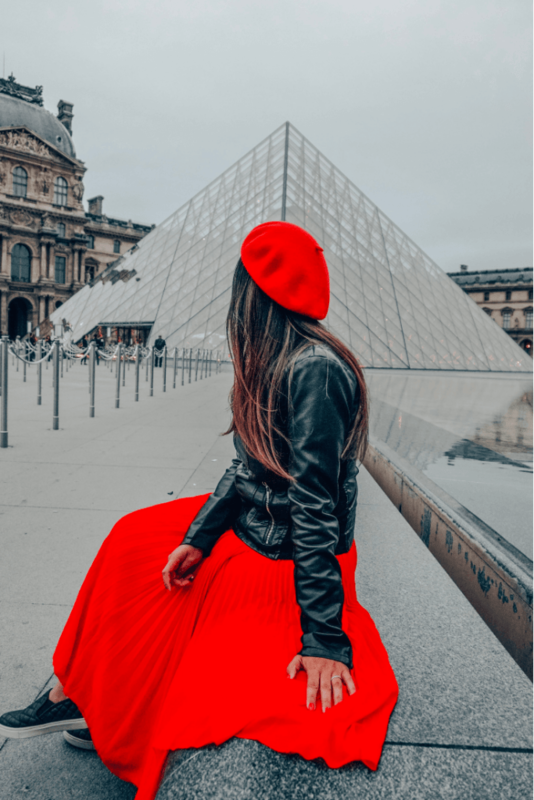 But stay there until the end when the museum closes to see the lights on the pyramid, capture images and then head to the Arc de Triomphe Carrousel to take a stroll. From the Arc de Triomphe Carrousel, you will see the Eiffel Tower illuminated in all of night’s glory. The Lourve Palace originally served as the royal residence of the French monarchy. This is where the WORLD FAMOUS Lourve museum is housed. Lourve museum opened its doors in the late 18th century, with royal exhibitions. Over the years, the Lourve complex and the museum displays grew in size. When the Palace of Versailles was built by Louis IX, the Lourve no longer served as a prime royal residence. Leonardo da Vinci’s Monalisa is displayed at the lourve museum, along with more then 350,000 other historical and arts items. The Lourve is the world’s MOST visited museum. If you are an arts museum lover, then plan for 2-3 hour stay here. The historical elements of the displayed items and the structure comes from the royal family (Lourve palace), the painters and the art history. Don’t forget to spend sometime at the Arc de Triomphe Carrousel after to watch the Eiffel Tower glow in night lights. There are a lot of restaurants and cafes by the Lourve museum for dinner. If the Eiffel Tower and the Lourve Museum are your prime sightseeing items, allot 3 hours for each (summit access, guided tour, etc). Trocadero, Champs Elysees (no shopping) and the Arc de Triomphe (including tower access) will not take a lot of time. You can explore the Opera House, Grand Palais/Petit Palais from outside – as they are in the same vicinity. But in dept exploration might be too tight for a day, but not impossible. The day 2 of your Paris Itinerary is filled with more sightseeing and experiences. Today we will cover some of the other popular Paris tourist landmarks. Let’s kick start the day 2 of Paris Itinerary with a visit to the Notre Dame Cathedral. Notre Dame Cathedral is a beautiful Catholic church located in Paris’s 4th arrondissement neighborhood. It is considered as one of the finest Gothic architectural landmarks and its beautiful architecture is characterized by stained glass windows, statues and bells. The Notre Dame Cathedral was built between the 12-14th centuries as the seat of Archbishop of Paris. It is a living museum and mass are held regularly. It is FREE to view and enter the cathedral. If you wish to access the cathedral wing tower, there is an entry fee of 8.50 Euros. 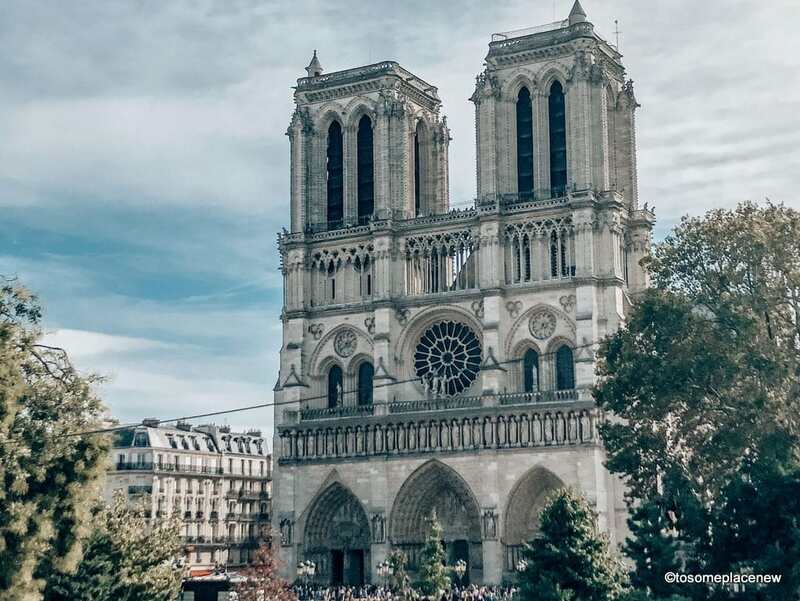 Here is a one hour guided tour of the Notre dame Cathedral – this tour covers the history and the interesting stories of the cathedral (including the Hunchback of Notre dame stories). By now, you have must realized that there is a river that flows through Paris and has been a significant contributor to the French history. The word Seine is derived from the Latin word Sequena – the goddess of river. The earliest mention of the Seine river is from the 800’s. Since then the Seine has witnessed Olympic games, murders and massacres (Algerian Paris massacre 1961), trades and commercial activity and history and literature on its river banks. There are over 35 bridges built over the river Seine – some are more stunning then the others and some historical and some very functional. Just like the Pont Alexander III (we saw yesterday), the Pont Neuf (or the New Bridge) is another popular bridge attraction. 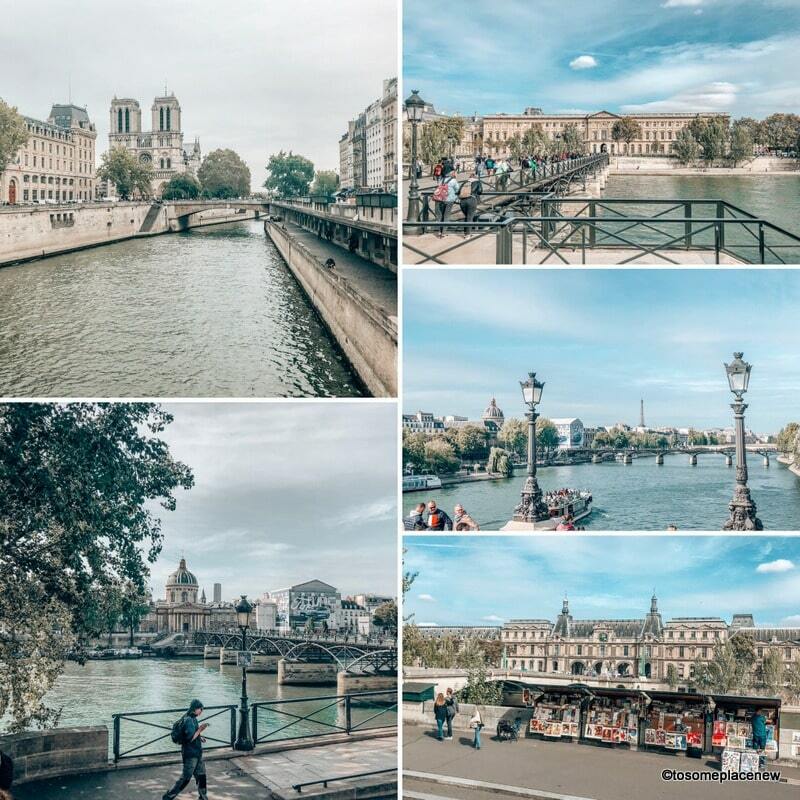 The river flows throughout the city of Paris, so you will see different versions and stories of the Seine. The Seine river area, close to the Notre Dame Cathedral is worth exploring. Île de la Cité is a natural island in the river Seine – this is where medieval Paris was founded. If you take a walk across from the cathedral, you will be able to view it. Continue walking to see some green colored book stalls. Seine has been also popularly described as the “river between 2 book shelves”. The Bouquinistes of Paris (aka the green book stalls) sell used and antiquarian books along the banks of the river Seine. These stalls have been located here since the 16th century. 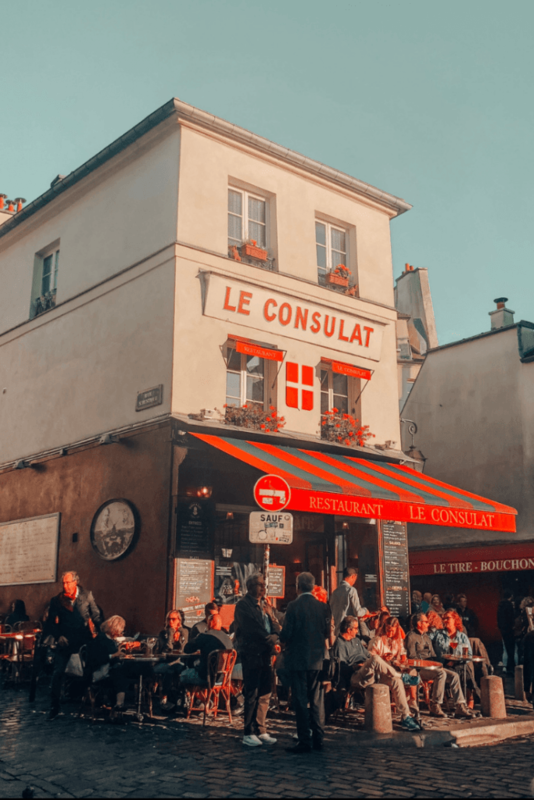 Home to the Paris Sorbonne University, the Latin Quarter, in the 5th (and part of 6th) arrondissement is filled with multi-cuisine cafes, bars and student areas. This is a perfect lunch stop for the day. The history of the Latin Quarter dates back to 52 BC, and had been a centre of education and learning for centuries. Latin Quarter is on the left bank of the Seine river. Start your exploration by taking a stroll along the Quai St Michel. You will see some book stores (famed Shakespeare and Co) and restaurants along the banks. Explore the vintage buildings, lanes and the Sorbonne University area, before setting down for a good lunch. After lunch, explore the Luxembourg Gardens (Jardin du Luxembourg) which is located on the cusp of 5th and the 6th arrondissement (in the artsy Saint-Germain-des-Prés neighborhood). The Luxembourg Gardens are popular for its lawns, beautiful flower beds and the picturesque Medici Fountain. 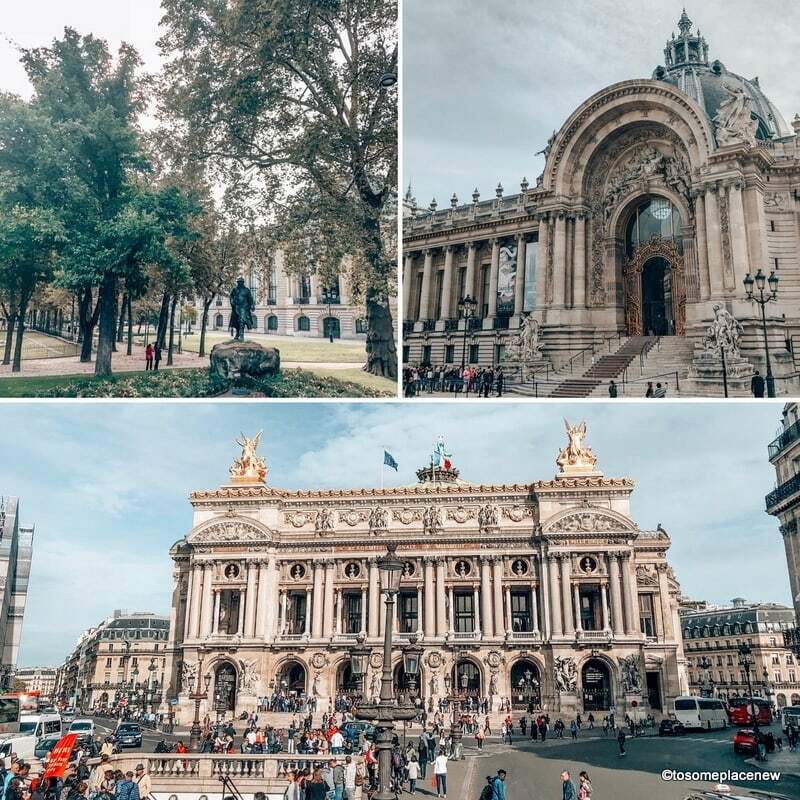 To make the most of your time, you can also take a 2 hour guided tour of Latin Quarter, that covers all of the above mentioned areas, including the Pantheon and the Musée d’Orsay (arts museum). Explore the guided tour of Latin Quarter here. The Pantheon, from a distance looks like a city hall, but it is was originally a church dedicated to Saint Genevieve, patron saint of Paris. Today it is the burial ground of some of the Paris’s famous personalities. Admire the architectural of this building, built in neo-classical style. Catacombs of Paris is slowly becoming a popular tourist attraction, but we do understand not everybody might want to visit this on their first trip to Paris. It is however, good to know. The Catacombs of Paris are underground ossuaries (room were bones of dead people are kept) in the 14th arrondissement – Montparnasse neighborhood. Catacombs houses the remains of more than six million people in a small part of a tunnel network. The reason for building this ossuary is not very “grave” as it might seem. In the late 18th century, many cemeteries (holy Saint Innocents) were falling apart and there was an urgent need to dispose of the dead bodies. As part of town planning, the remains were moved to a mine shaft. Years went by and this place was almost forgotten, until excavations were done. The streets of Lourve to the Eiffel Tower and beyond form a part of this dark tunnel. From Pantheon to the Catacombs of Paris, it is a 6 minute drive or a 25 minute walk. You can explore the catacombs only with a guided tour. This guided tour here is for small groups only. It is for 2 hours. The inside of the tunnels are dark, uneven and could be claustrophobic (and sometimes dark and chilly, also eerie). Hope you have some energy for one last item of your Day 2 Paris Itinerary. Whether you visit the Catacombs or not, this SEINE river cruise should not be MISSED. We have taken quite a few day and evening (sightseeing) cruises and we loved them all. 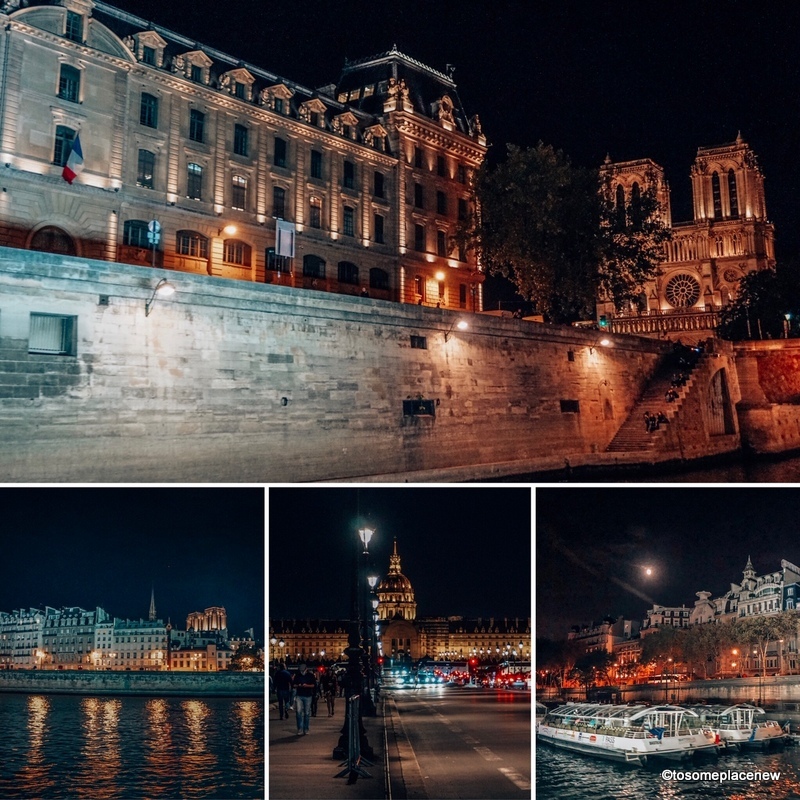 With the Seine River Cruises, ranging from 1 hour to 2.5 hours, you can capture and see MOST of Paris’s iconic landmarks, whilst sailing on the Seine. Bateaux Parisiens is the starting point for Seine River Cruise and it is FREE with the Paris Pass. You can take this cruise anytime (day or evening), it has a 1 day validity. Here is the one hour sightseeing cruise information.We prefer doing this in the evening, so we reached there at 08:45 pm. Whatever time of day it is, bring a scarf or a light cardigan, as it could get chilly. If you have not made any dinner plans, consider taking Seine River dinner cruise 2.5 hours. It is so romantic and will definitely make a great Paris memory. 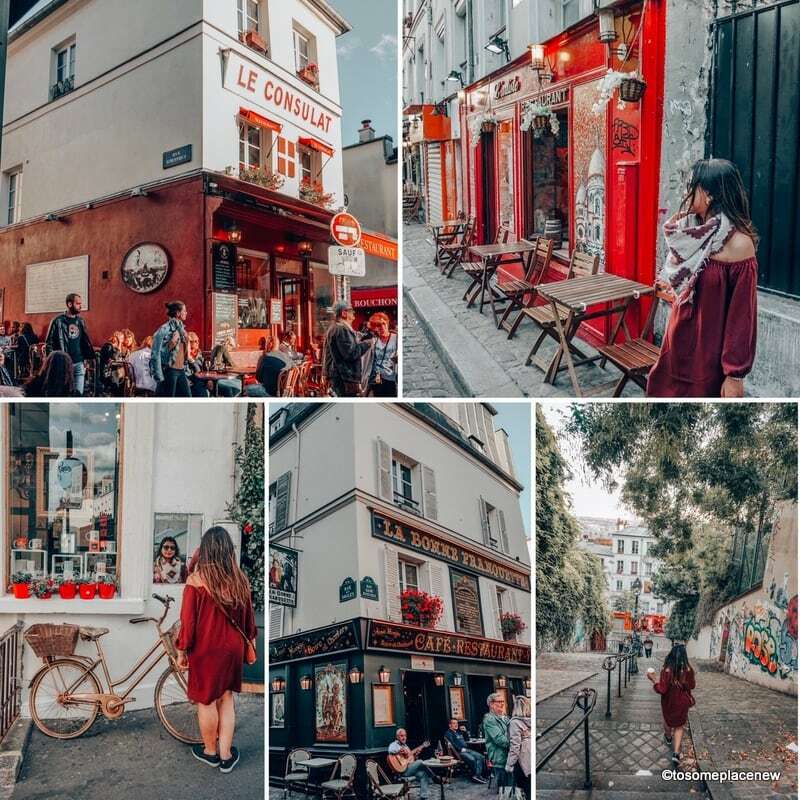 On your third day in Paris, pick a neighborhood and spend the entire day there – get lost in their lanes, try out some local cafes and cuisines and just fall in LOVE! We picked the Montmartre district to explore. 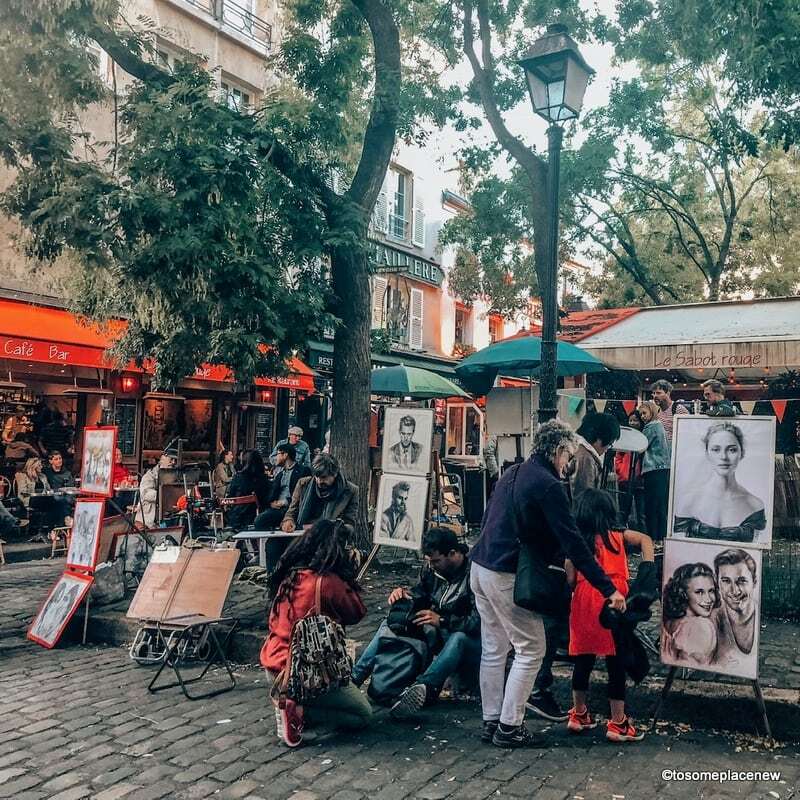 Of course, there are other areas that you can visit too like – Marais or the Latin Quarter, but we hope you fall in love with Montmartre like we did. Montmartre today is a popular Parisian neighborhood located in the 18th arrondissement. It is also an official historic district, meaning the city of Paris is trying to preserve much of the vintage and bohemian vibe of this neighborhood. Before we explore Montmartre, it’s important to understand its history (and you know how MUCH we LOVE history). So Montmartre is the name of the hill that overlooks the district and it is also the name of the district itself. Montmartre means “mount of mars” (in Roman. Frenchman call it the “mount of martyrs” and there is a reason why). Until the late 19th century, Montmartre was not a part of the city of Paris nor was the stunning Sacre Coeur built. The village, as it was back then, was filled with gypsum mines and traders. It had also witnessed French wars of Religion and Franco-Prussian wars, and the Germans had once upon a time also occupied the Montmartre hill (for bombardment. It’s a hill, so it worked for military expeditions). Montmartre’s iconic landmark – Sacred Heart Bascilica or Sacre Coeur was completed in 1919 and slowly this little village was filled with artists (painters, cabaret dancers, and the like) and cafes. 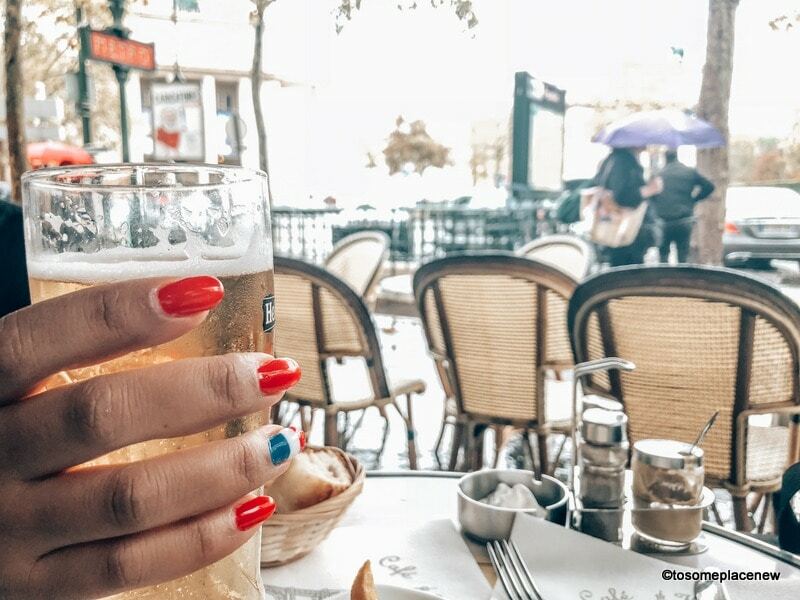 When you walk through the district, you will find cafes that were frequented by the likes of Vincent van Gogh, Pierre Brissaud, Raymond Duchamp-Villon and more. These lanes are completely Insta-worthy and vintage-y. Blanche station (near Moulin Rouge) are some options to get to Montmarte. Once you are in Montmartre, you can spend the day exploring all the sightseeing spots. If you prefer taking a guided tour, here is a GREAT option. 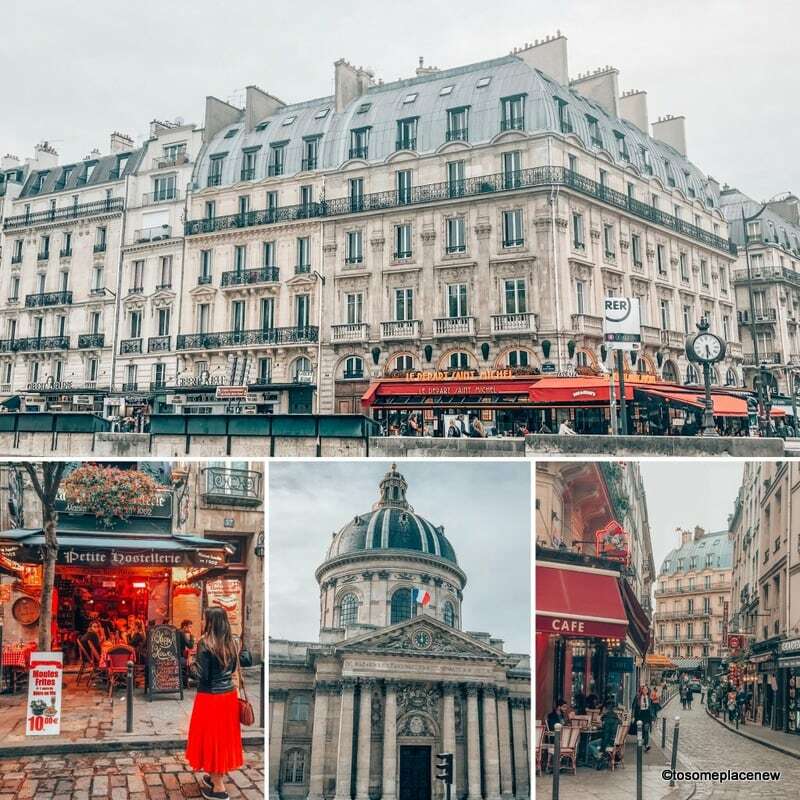 This recommended walking tour is a small group tour which starts from the Paris metro station and takes you to all the important sightseeing areas. Tour is for 2-3 hours, leaving you with plenty of time to relax, eat and spend the day. The Scared Heart Basilica of Paris, known as Sacré Coeur is located on a hill in Montmartre. The basilica was built and opened in 1919. The entry to the basilica is completely free. To access the church towers/dome, there is a fee of 5 euros. This entry fee is worth it as you can get amazing views to the entire city from the top. The basilica is opened everyday from 06:00 am to 10:30 pm. Try to arrive early for some photos or a light stroll by the basilica. Sacré Coeur is easily accessible by bus from one of the nearest Montmartre Paris Metro locations (Pigalle, Ansvers stations). Sacré Coeur is definitely an iconic landmark, but the streets and quaint lanes of Montmartre is what will leave your heart wanting for more. 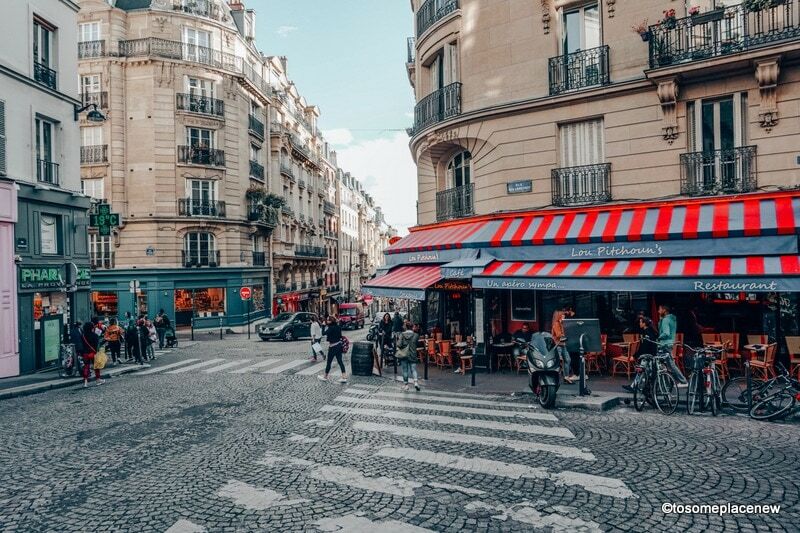 Take a walk from the metro station towards the Sacré Coeur or vice versa, you will see red-green cafes, old vintage buildings, souvenir stores, street art and murals. These small lanes are also lined with con artists and pickpockets, so always be careful. Carry the basic items that you need and enjoy the neighborhood, eat and drink to your heart’s content. Le Consultat – Le Consultat is a cafe in Montmartre that was frequented by popular artists in by gone days. Today, it is one of the most photographed pictures for Instagram. Rue de Steinkerque – The streets of Rue de Steinkerque are bustling with French souvenirs, T-shirts and more. Best way to mingle and get lost in this neighborhood. Place du Tertre is a popular square in Montmartre. Rightly popular as the Montmartre artists square, this place has been an important seat of arts and art display since medieval times. Today you can find artists painting or selling their artwork. This square is lined with cafes and restaurants, perfect for a pit stop to try some macaroons or crepes. Moulin Rouge is the FAMED cabaret in Paris France. Located near the Blanche metro station, this landmark with the iconic red windmills and lights are hard to miss. The heritage of cabaret at the Moulin Rouge dates back to late 1880, and was evolved from the popular can-can dance (a very high energy, physically demanding dance to a seductive cabaret). The original building was destroyed was fire and later rebuilt. Today it is a popular tourist attraction and if you did like to spend the evening with dinner and music-dance, head to Moulin Rouge. The shows and dinner at the Moulin Rouge gets sold out often, so book in advance. Here is a highly recommended Moulin Rouge show (Féerie) with dinner options. On day 4 of your Paris Itinerary, head 20 kilometers southwest of the French capital to Versailles. There is a BIG reason why you should include a day tour to the Palace of Versailles. Actually I will give you 2 reasons. For one, the Palace of Versailles was not only the residence of the French monarchy – but also a symbol of political power shifts and luxury. 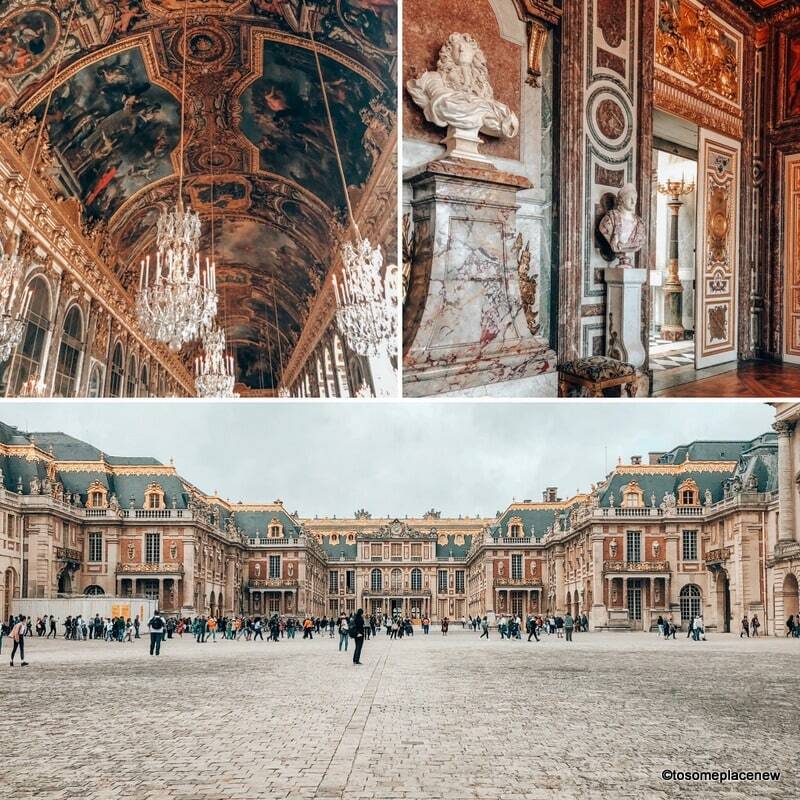 What was the Louvre palace to the monarchy once, was now the Palace of Versailles and later on, the Tuileries Palace became the royal residence of the French monarchs. Visiting the Versailles Palace and learning about its history closes the loop on the missing piece that’s hidden in Versailles. The second reason why you should visit Versailles (and the reason why I wanted to visit), was to see where the Treaty of Versailles was signed. As a modern history student, I studied about the Paris Peace agreement and the Treaty of Versailles which concluded the First World War (with difficult terms for Germany) and REALLY wanted to see the room where the agreement was signed. I did see the place/room where the treaty was concluded and boy! the war ended by signing the treaty (in style?) at the luxurious Hall of Mirrors – the most STUNNING and expensive rooms of all. We took a day tour from Paris to Versailles and we HIGHLY recommend you take a guided tour as well. The palace of Versailles is ONE of the busiest and most visited palaces in Europe. We took an early tour (arrived at 08:30 am) and the palace complex was packed. We had to wait for our guide to get us the tickets to get in to the Palace courtyard – without a guided tour, we would be waiting FOREVER. Here is a guided tour that we recommend. It is a half day tour, so you can return to Paris in the afternoon and spend the evening there or take a full day tour to Versailles and Giverny. If you would like a private tour to Versailles, here is a great option. You will be arriving in Versailles in an AC car and will be provided with a guided tour of the palace and gardens. Once you arrive and gain entry to the palace, you will be guided to different rooms. Your guide will provide you with brief history of each room, the architecture and other stories of the French royalty. You will definitely hear about Louis IX and why he decided to move the royal residence to Versailles, how the palace was built and what led to the French Revolution and the ousting of the monarchy from their beloved Versailles palace back to Paris. When you explore the interiors of the palace, you will be in a small group of 5-7 people only, so ask questions and learn about the French history. After your guided tour of the palace, spend some time at the palace gardens (Jardins du Chateau de Versailles). They are beautifully curated and are awesome for taking photos. There are washrooms located inside the palace and outside at the gardens for patrons to use. The palace complex also has a café (we had some lattes and smores), gift and souvenir store inside. This itinerary is designed in a way that you can explore each day independently of each other. So you only have 1-2 days, pick Day 1 (best of Paris) and may be Day 3 (Montmartre) or a day trip. If its only ONE day and this is your first visit, then for sure do the Day 1. All these Paris tourist spots, by Day, are located close to each other, so you can cover them easily in a day – as outlined. France is located in Europe, and it part of the Schengen agreement. If you require a visa to travel to the 28 Schengen countries, then you will need to apply for France travel visa/Schengen travel visa before arrival. Learn more about Schengen Visa process. If you have a European Union passport, you won’t require a visa for France. All the visa exempt countries like USA and Canada can travel to France and stay for 90 days without visa, right now. From 2021, all the Schengen nations require visa exempt countries to apply for an ETIAS – European Travel Information and Authorization System, which although not a visa, requires US and Canadian passport holders to apply for an ETIAS (electronic travel authorization) to travel to France and other Schengen countries. Unlike the Schengen visa, the ETIAS is pretty forward and very easy to get. Apply online and get the authorization in 24-48 hours. Whether visa or ETIAS, ensure that your passport is valid for 3 months after the intended date of departure from Schengen zone. Learn about ETIAS here (2021). The official language of France is French. Hotels, tour operators, stores and restaurant service providers spoke both English and French. In our Paris trip, we did interact with passers-by looking for directions and all the people we spoke to were very friendly and helpful. Yes, they do speak French extensively, but they did understand English and they responded back in broken English. Hint: Download Duolingo to learn a few common French phrases or words. Google Translate is a handy app as well. Not to forget, offline maps for directions. For your trip to Paris, wear pretty dresses, clean cut pants/jeans and of course the usual travel essentials. If you are traveling on a long haul flight, here are a list of items here are a list of items for in-flight and arrival. Things to avoid – Avoid flashy or expensive items on your travels. Paris is the fashion capital and you can avoid looking like a tourist (to a certain extent. Don’t try too hard though). Avoid clothes that are TOO loud (color or graphics). Wear clean cut and mono-colored clothes. Carry flats, oxfords or closed toe shoes that are comfortable to wear and walk long distances. The weather in Paris is similar to the rest of Europe. It is rainy for most times of the year. Winters are not extreme (like winters in North America). As you can see from above, summer months are from June to August – this is a popular tourist season and things are crowded and busy. Winter time is also a popular season to visit due to the Christmas and holiday events. Fall is considered to be the BEST time to visit (in most countries) and Paris is no exception. Tourist places are less crowded and flights are cheaper. We visited Paris in fall (late September). It did rain every now and then, but it was not too bad for exploring. Our flights from Canada to Paris, France cost us about $665 USD and we booked our accommodation at a 3+ star hotel. Hotel room rates were $125 USD for each night (not in a central location). We did take tours and used the RER local transit. So on an average for the day, we spent around 150 USD for the two of us. It is a good idea to budget for $100 USD per person per day for meals, museum entry, tours and transit costs. Our day trip and hop-on and hop off tour was booked in advance and online. Euros are the mode of exchange in France. So carry cash (in euros, in limited amount) and credit cards to pay for expenses. Food – what to eat in Paris? There are cheap things that you can eat in Paris and then there are lavish, expensive dinners to indulge in. We recommend that you do both. There will be days when you are tired and you just wish to eat “something” and go to bed. Get groceries then. Try something from the small/local cafes – baguette, croissant or lattes. A latte/coffee with a baguette will cost around 8 euros. If you can budget for that for 1-2 days, then it is a great way to experience the popular food in Paris. Food tours (cheese and wine tasting tours like this one) are a great option if you wish to keep costs low, but still experience food in Parisian style. 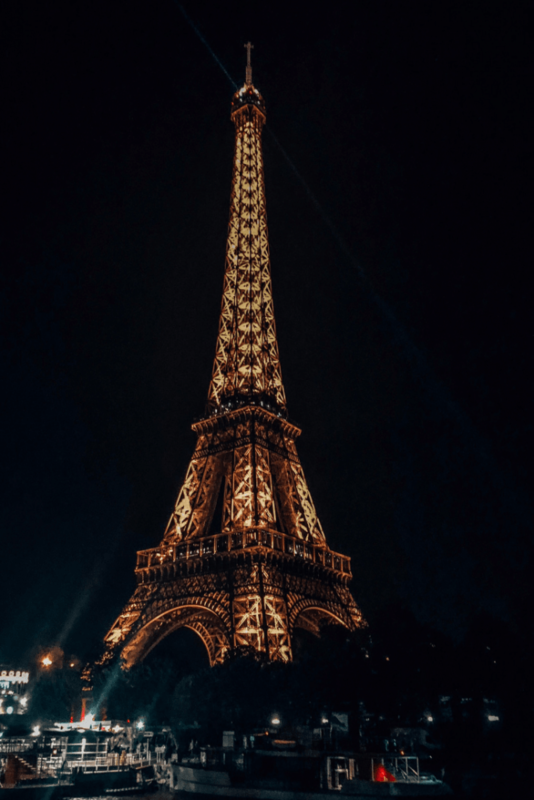 Another option is to book a dinner meal with the Seine river cruise which comes with a 3 course meal on a cruise and it is well worth the money. It is a romantic way to spend the evening and also to try out some French cuisines. VIP Michelin Food tours are also available in the French capital city. 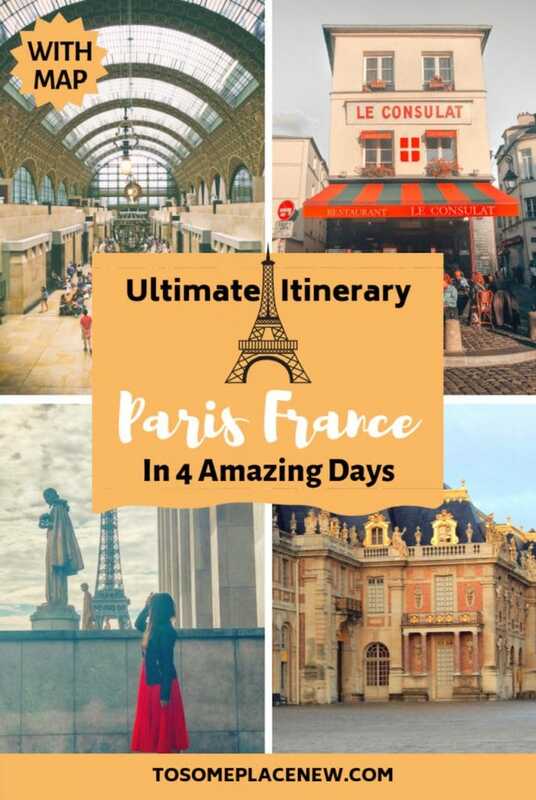 We hope you enjoyed our ultimate 4 day Paris Itinerary. This was our first time in Paris France. We tried to make the MOST of our trip and covered these areas extensively. We have followed Day 1 and Day 2 spots in a sequence as they are located close to each other or are easily accessible. We did utilized the hop on and hop off tours and it allowed us to make the most of our time in Paris. « Ultimate Packing List for Mexico – What to pack for Mexico? Mayuri well thought and properly described. Keep on doing, very helpful. I hope to put to use your travel/tour guide of Paris. I hope to take my family on a tour of Europe later in the year and I will be glad of suggestions and ideas on how to have a 12 day visit to France, Spain, Italy and Germany. I intend to do the 4 countries visit on a Schengen visa being from Nigeria with my family (wife & 4 kids,the oldest is 4 and the youngest are 6 months. Hi Sen, thank you for your comment. Glad you found the Paris guide useful. You can start your trip in Paris and then head to Munich (Germany), the train journey is around 5 hours. We have a Munich itinerary on our site as well. From Munich, you will either have to take a flight to Barcelona or Rome (Italy) to make the most of your 12 days. Trains or drive won’t be feasible. Munich to Barcelona is only 2 – 3 hour flight and then fly down to Rome.